The IEF have found that young people growing up since the Belfast/Good Friday Agreement are still acutely aware of divisions in everyday life in Northern Ireland – and they want those divisions broken down. A two-year engagement project with 16-24 year olds in Northern Ireland found that the majority see themselves as living in a divided society and want political leaders to do more to address that situation. The Integrated Education Fund sought the views of thousands of young people through independent surveys and face-to-face meetings. 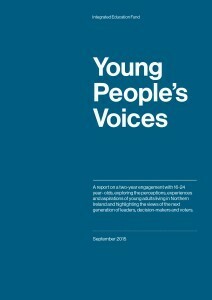 The results of that work can be found in the IEF’s “Young People’s Voices” report. The IEF’s work with independent researchers, youth and community groups and more than 2,000 young people has resulted in a picture of a generation growing up divided but with a determination to see divisions dismantled. The clear message to politicians is that progress towards a united community is too slow. Many young people feel that they are affected negatively by segregation in housing and education and also feel let down by the education system when it comes to the jobs market. In her foreword to the report, NI Children’s Commissioner Koulla Yiasouma says “This report provides an important contribution to the debate we must have in NI about the type of education system we need going forward. The young people have clearly stated that “doing nothing” is not an option; they are calling for a more integrated community and an education system that does not divide them on the basis of religion, gender or class and which gives them the best opportunities to realise their potential. • More than 80% of those questioned agree that an education system bringing children of all faiths and none together in the same schools would be an important step in combatting sectarianism.